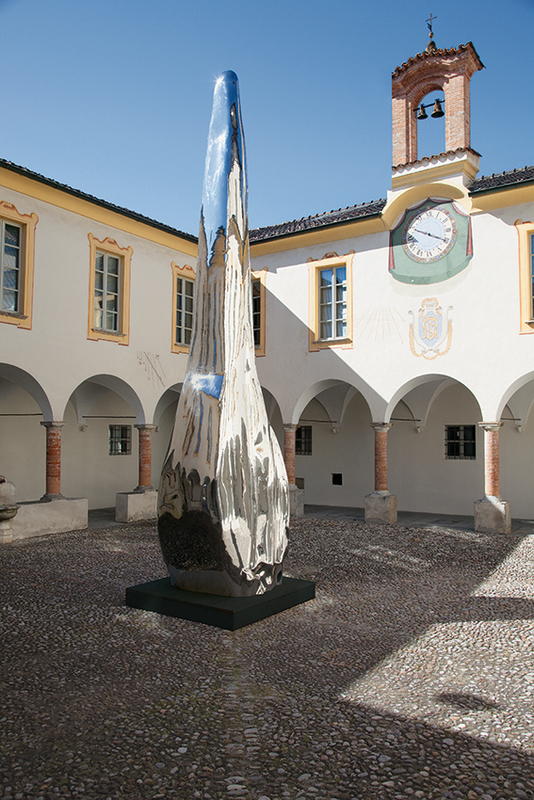 The wide selection of works exhibited until January 2015 at the Art Museum in Mendrisio offers a cross section of the production of Grisons artist Not Vital. If traveling is the constant of the show, departure and arrival match in the never ending research of a dimension that is both personal and universal. The Museum of Art in Mendrisio (CH) takes place between the rooms of the convent of the mendicant Servit Order that managed it from 1447 to 1852. The complex looks intact in the order of the outer stone walls and of the severe arch of entrance. The inner courtyard reveals a more cordial soul, a looser breath. Since September 26th the lines of the ancient religious building look slightly twisted, like the magnetic interference on a monitor signal. A massive body in mirroring metal cautiously lowered from the top of a crane adds a dimension to the perimeter of the courtyard and dances in the reflections of the surrounding cobblestone. 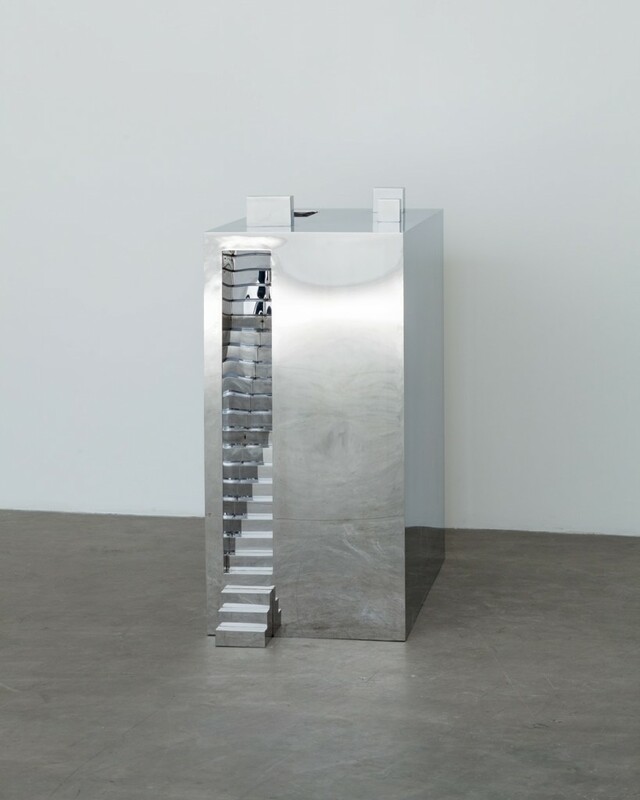 A risen middle finger, phallic, a stretched arm, a totem, pagan and brazen; it is Tongue (2008), a calf tongue in stainless steel of about eight meters height. The name of its author is Not Vital and this is the first piece of his personal exhibition; Il pavimento della cucina di mia nonna (The floor of my grandmother’s kitchen). The exhibition–curated by Simone Soldini and Alma Zevi–marks the contemporary landmark of a path that alternates within the rooms of the Museum of Art in Mendrisio the works of its archive, the great names of the last century, sacred art, the homage to the local artists. Not Vital couldn’t miss it. The show confirms the artist’s vitality and the extent of his work. The little Swiss town on the borderline with Italy stages an audacious anthological parade of the styles, languages and ambitions of the Swiss sculptor. Tongue is definitively the exhibited work most monumental and eloquent. Beyond the courtyard, at the first floor of the museum, the works compact though maintaining the constant of a syncopated alternation in their proportions and disposal. 750 Knives (2004) waits, frontal, threatening and immobile as the locomotive of the Lumière Brothers. Turn the corner, the fetish of the kitsch lingers on in Portrait of My Parents (1996), a memory trophy, life seen from the eyes of Saint Eustachio’s deer. On the walls are Snowballs (1999)–or rather when the aquatint becomes the index of frozen water–and the series Everton (2014), proving that the gaze needs no eyes. HEAD 4, primitive and metaphysical, seems to be drawn from a back-lit model. Lips, ears, nose and orbits give way to the eloquence of a pure profile. A tiny room hosts the photographic documentation of the artist’s sculpture/architecture between Niger and Patagonia. Here function doesn’t count if everything is about volumes, extracted or expanded. Confirmation comes from the steel model of House to Watch the Sunset in Lamu (2013). You cannot write about Not Vital without mentioning the word traveller. Indeed. The artist must have realized that nothing is more universal than the local. Like in a book by Lévi Strauss, everything is exotic, even the domestic. This is how the four corners of the world meet into Not Vital’s studio–his mind–between the hands of Tuareg or Chinese craftsmen, under the chisel of perennially indigenous workmen. His is an encyclopedia sophisticated by the Mittel-European matrix, refined by the Italian and French studies, by a life in New York. A purely cultural operation, from the Latin colere. From the walls to the floor. Piz Nair (2011) is a block of coal on a steel base, as vertical as the telluric push that made Switzerland. 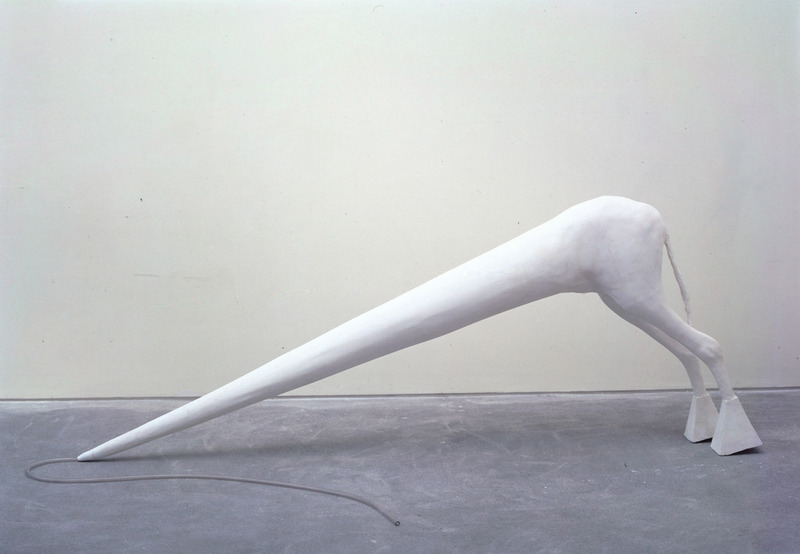 If Piz Nair is extraction, subtraction, Il Toffus (2000)–the grotesquely surreal graft between cone, frustum of a pyramid and dog–is assemblage, addition. Herd–leaning as the hypotenuse between the floor and the wall–is a little platoon of camels heads impaled like wooden horses. Landscape, Mountain e Mountains play dices with the chance to superimpose three different linguistic planes: the deep splay typical of the Lower Engadine windows, the Alps poetically evoked in the veins of the marble, the ink as the synthesis of Chinese horizons.